Rose Quartz (RQ), Gold (GD), Ivory (IV), White (WH) *Please refer to Special Color Set swatch card. Great rustic style in English Netting fabric in our lovely new color- Rose Quartz! 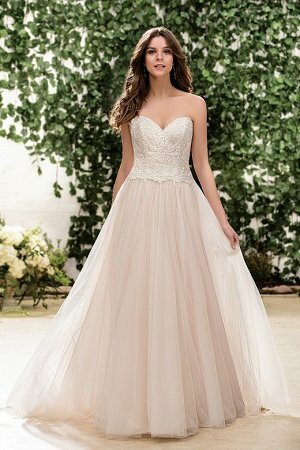 This airy gown feautres a romantic color and Embroidery lace in princess A-line shape and skirt with beautiful movement!